Last week, I was invited to the MoroccanOil event and product launch. Being a self confessed fan of their argan oil treatment, I was looking forward to the launch. I've been using the MorrocanOil treatment for quite sometime, and must say, the results have been pretty good. The venue, Tote on the Turf, was decorated in hues of blue, white and orange. Pretty little silver lanterns, with a bottle of their popular MoroccanOil original treatment, adorned the center tables. Let's take a look at how the event unfolded (there is also an interesting video to watch out for). 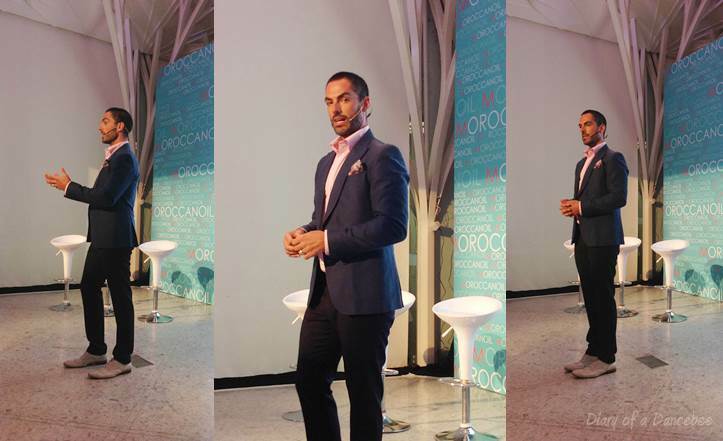 As we began to settle down, the event organizers started off by introducing the artistic director of MoroccanOil, Antonio Corral Calero. Within seconds, Calero (he is one enthusiastic and witty artistic director, I must say) took over and started off by telling us about the company's history and his role. Calero has been the face of MorrocanOil since a couple of years, and has made his presence felt at famous runway shows including Just Cavalli, Carolina Herrera amongst others. Calero said, "We want consumers to be able to have the same experience at home as they do in the salon." I don't know about having salon like hair 24x7, but MoroccanOil products do work wonders. At least in my case, it did. Calero also experimented with different hairstyles, and showed us how MoroccanOil products can help us create new looks everyday. "It's time Indian women let go off their favorite hair- clips. You girls seem to be in love with it," he said. While Calero was busy creating new looks, members of his team gave us detailed information about their new range of products. Two items that stood out for me include the luminous hairspray, which can be used for creating soft, and natural styles. The other one, called Glimmer shine spray, can be used to give the perfect final touch to your hairstyle. Fans of argan oil, you will definitely love this range. Most of these products are priced at Rs 1000 and above. So far, I have been using one product and the results have been good. So, It's nothing less than an investment for your hair. For those of you who want some more details before you go ahead and shop, I'll be reviewing some of their products very soon. Calero and his team posed for the shutterbugs as the event came to an end. Bloggers and members of the media were delighted to find a beautiful gift hamper waiting for them at the exit. Must say, I loved the packaging. Kudos to the team for organizing this lovely event.